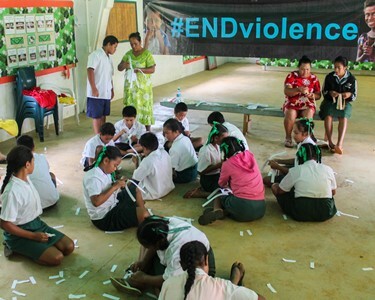 Project manager Michelle Paiti was visiting the Southern group island where she delivered the two-day training workshop and promoted the ENDviolence against women and children campaign. “We received a lot of positive response,” says Paiti. The course attracted a total of 14 participants including teachers from the Enuamanu primary school and community leaders from the St Anthony Boy Scouts & Girl Guides and the CICC Boys Brigade, Girls Brigade & Girl Guides. This was followed by a practical session out on the pitch with students from the school. With social responsibility also being an important part of the programme, participants were educated on how to deliver key social messages and adapting it to different age groups. Paiti was impressed by how easily this was absorbed and practiced. Following the two-day course, participants were presented with certificates and Just Play kits containing balls, rings, cones & markers, bibs, a whistle and a pump. In addition to the training course Paiti achieved another stepping stone on her outer island expedition. She introduced the Weave a Star Project to students at Enuamanu School in aid of promoting the ENDviolence against women and children campaign. The project was welcomed by the Year 6, 7 & 8 students who managed to weave a total of 112 stars. In return the students were rewarded with a Pacific Spring-sponsored slap-band each with the words “Vaima keeps me moving” imprinted. This is the second time Just Play has been to the island of Atiu with the last visit being in 2012. With the exception of one teacher all participants in this course were introduced to the programme for the first time. This was however a delivery of new content for everyone who joined in. Just Play would like to thank the Enuamanu school principal Syaka Tairi, the uniformed organizations of Atiu, as well as the island community for receiving the programme with open arms and the St. Anthony’s Parish for a wonderful catering service that was provided during the course.